"Cult club night Work It take over the Roundhouse for a day-long festival in 2017 with three stages jam packed with live music and DJs, plus food, drinks, good vibes oh, and a cinema in the crypt. 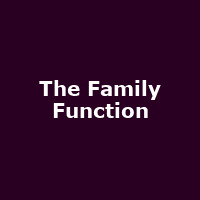 Work It's biggest event to date, The Family Function brings together a soulful line up that goes deep, with live performances from the most exciting artists, producers and DJs pushing things forward. Expect everything from R&B, Hip Hop, Afro beats to experimental, otherworldly electronic sounds. This one is not to be missed! "